It’s been a while since I created anything tangible, so I was chuffed that the HAHA Industries guys asked me to come up with some visuals for their D&D’s Beat Ballroom night at the Sydney Fringe Festival this month. Given creative freedom, I thought it would be a great opportunity to try out some technical ideas I’ve had floating around my head for a while. I’ve always been keen to try a projection setup that uses multiple scrims in a similar way to stage theatre. The main difference in this first test is that there isn’t a person or object to reveal behind the front scrim, but another screen. The material used in theatre is often called ‘sharkstooth scrim‘ and is fairly expensive, so I decided to try a cheaper alternative for this test run and make my own. Gluing mesh to the frames. I used a cheap, synthetic mesh for these frames. Imagine a hexagonal white flyscreen and you’re pretty close to the mark. The mesh was glued to flyscreen frames that built specifically for the installation and to keep them steady, I put together some feet, made from parts that I found lying around the house. Not particularly slick, but for around $15/screen they made for a good first test run. What the cheap mesh doesn’t do effectively is create the changing opaque/transparent effect of the sharkstooth scrim. Even when projecting at a sharp angle onto the front screen, the effect is more of a ghostly, translucent image rather than hiding what’s behind it completely. Instead of heading back to the drawing board, I chose to work with this effect as best I could. 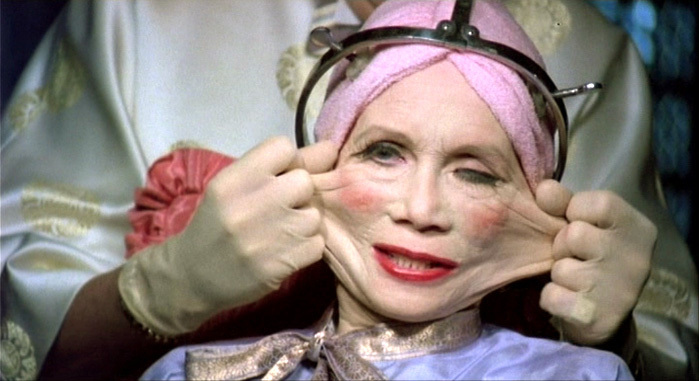 I’m a big fan of the 1985 Terry Gilliam film, Brazil. The aesthetic is a very British vision of a 1984-esque dystopian future, that still feels relevant (maybe even more so) today. I particularly like the constant distortion of faces throughout the movie and the tension between which is the surveilling and the surveilled. 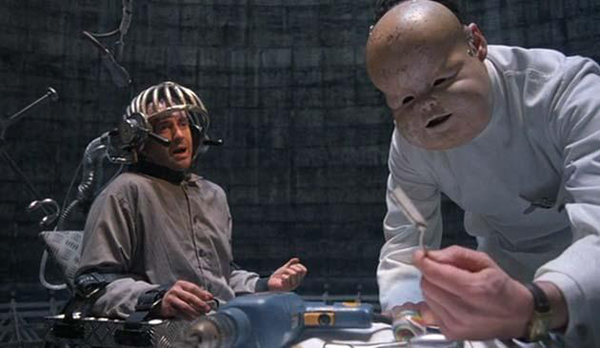 Whilst catch phrases like “Suspicion Breeds Confidence” from the fictitious government agencies are clearly Gilliam’s dark humor, it really doesn’t feel so dissimilar to the political and media climate of today. It’s not much of a leap from Gilliam’s pacified public in Brazil to the overarching reach of talkback radio hosts like Alan Jones. Consistently trying to persuade the discourse on important and polarising issues, Jones has more ability to push his right-wing populist agenda than our generally impotent Government, as shown by the Cronulla Riots of 2005. Heavy-handedly, I chose Jones’ disembodied head to be the centrepiece of Keeping Up With the Joneses, and to cycle through shots from the 2005 riots alongside slogans from Brazil. Frankly, matting out his awful head from a YouTube video is hours from my life that I would rather forget. The installation ran autonomously from a MaxMSP patch, using an audio line in to trigger effects and changes. I was hoping to have a lot more content (including some interactive camera tracking) ready for the installation, but it wasn’t to be on the night. In terms of visuals, I think the substance was lacking, but I had some good feedback on the process itself. It was a tricky setup; needing a couple of mirrors and heavy keystoning to get the projection split onto both screens, but the ultimate effect was an interesting sense of depth and ethereality of the images. I’d like to explore this effect further, possibly on a larger scale, with the audience able to physically move through layers of projected light. The MaxMSP patch is something of a frankensteinien mess, but as always, you’re welcome to have a look around.